Resource Book by Calvin J. Roetzel. A Resource Book is recommended for each participant. Click the button to view a chapter of the Resource Book. View the Leader Kit here which contains the items the leader needs to facilitate the course. A unique opportunity that only happens once every 500 years! 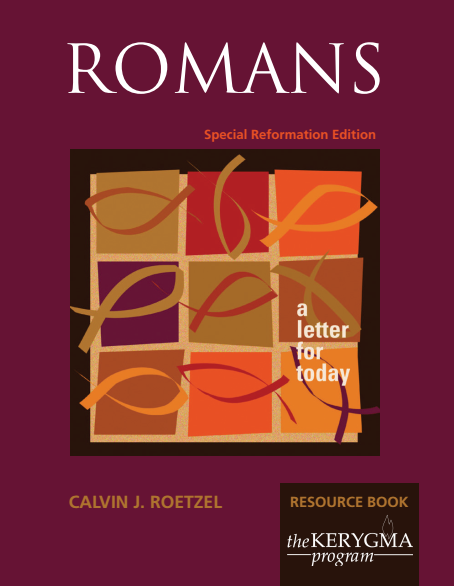 This revised and updated edition of Dr. Calvin Roetzel’s study of Paul’s letter to the Romans includes a NEW opening session in observance of the upcoming 500th anniversary of the Reformation, 1517-2017. Introduce your congregation and study participants to the role that Paul’s letter played in the life of seminal reformer Martin Luther and the events surrounding the Reformation. Discover why Romans is called "the most inspirational letter ever written." Appreciate why these words to the Church in ancient Rome echo still with energy and power. Encounter theology in the making as Paul wrestles with enduring issues: justification and grace, sin and salvation, a vision of unity, and the faithfulness of God—the same issues that believers, old and new, have contemplated throughout the history of the church. * 15 or 9 Sessions. The revised Leader's Guide includes Dr. Roetzel's suggested consolidation without missing any of Paul's important message to the Romans. · Was Paul's Gospel Soft on Sin? · Are God's Promises Reliable? · The "Weak" and the "Strong"